It's time for another Tablescape Thursday with Susan of Between Naps on the Porch! Thank you to Susan, our always charming and ever gracious hostess. Several of my favorite blogging friends have mentioned that my new posts (infrequent of late) are not appearing on their reading lists. I'm not sure why. Perhaps it relates to FeedBurner. A few weeks ago, someone asked if they could subscribe to receive Affordable Accoutrements via e-mail. In trying to set up that option, I fear that something went awry. If you'd like to try "re-following" AA or subscribing via e-mail, I'd be interested in hearing if that seems to work. I'm very sorry for the inconvenience. 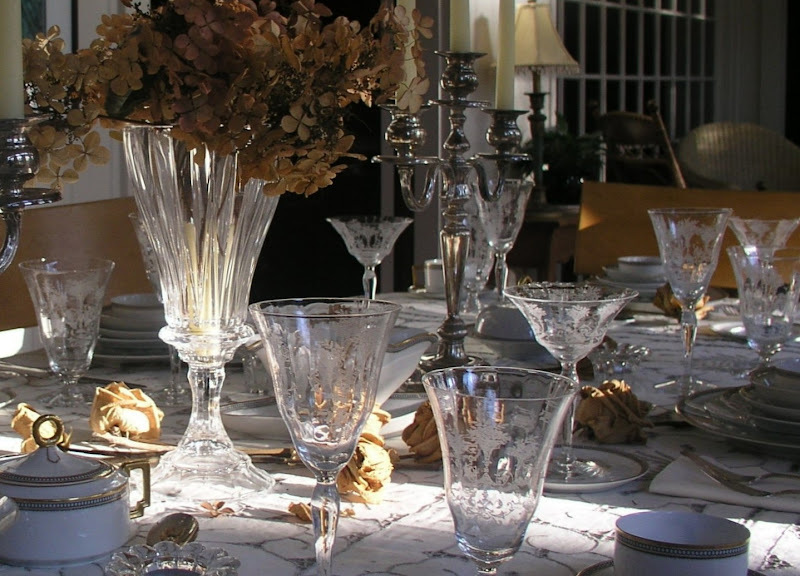 In recent weeks, I've set tables for you reminiscent of the 1930's and early 1960's. Today, I'm focusing on the World War II era. The china, circa 1938, is by H&C/Heinrich of Selb, Bavaria. The company is still in operation, a division of Villeroy & Boch. I've combined two slightly different patterns for today's table and included a few relatively unusual pieces, such as a round butter dish and ramekins with underplates. Obviously, this is a fantasy setting. If I were really serving a meal today, I'd remove at least half the pieces from each place setting. Above each plate is a butter pat, also known as butter chips, butters, butter pat plates, butter pads, and individual butters, by RC, Bavaria (the R stands for Rosenthal, another German company ... still in business after 125 years). Butter pats aren't used much these days, but I've found them to be perfect spoon rests to protect the tablecloth after guests have stirred iced tea. The crystal is "Mayfair," an etched pattern by an American company, Morgantown (closed in 1971). Mayfair was produced in 1943/44. The flatware is "Rio," by Oneida, 1939. 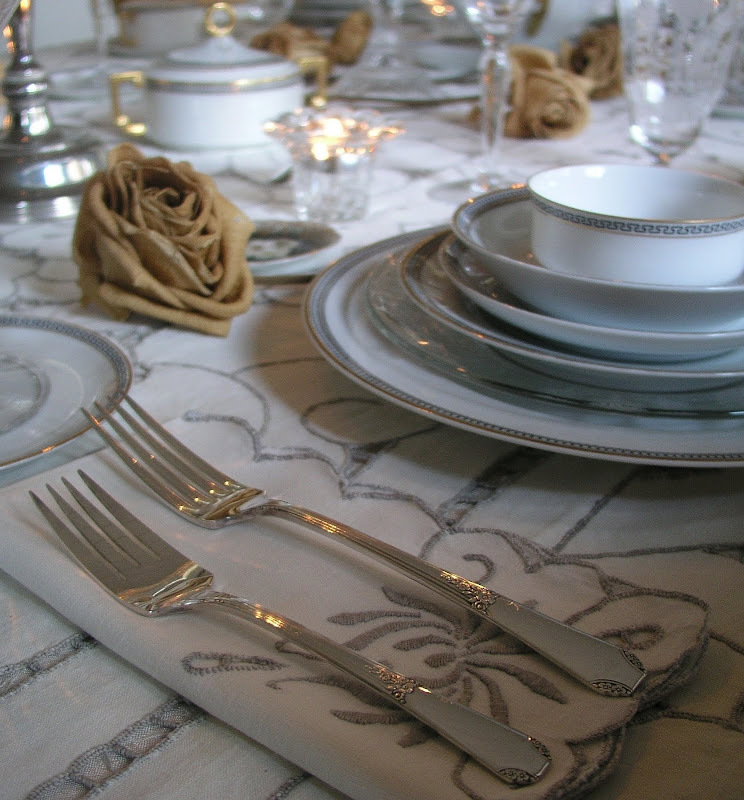 Table linens include a vintage cloth with cutwork embroidery and matching napkins. You've seen the flowers before, dried oak leaf hydrangeas from the garden. After checking the rose garden, I was reminded of the poem, 'Tis the Last Rose of Summer. 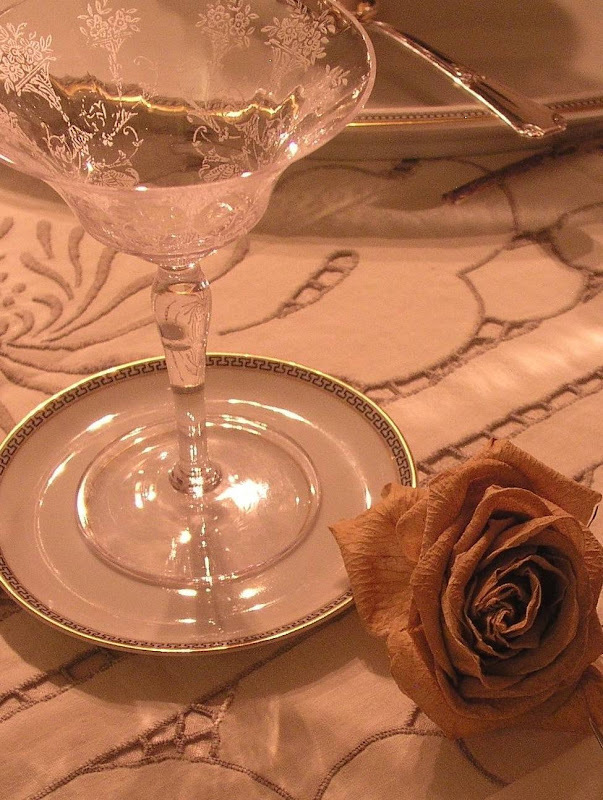 I placed a dried rose at each place setting and scattered others in the center of the table. The first step in the needle etching process was to dip the ware to be etched in wax. The wax-coated glass was then taken to the needle machine. The operator carefully placed the ware upside down on a rubber-cushioned plate where it was held fast by suction. The glass was slowly rotated while the machine’s needles traced the pattern into the wax. Plate-etched designs were produced using similar methods; however, the pattern was first produced on a steel plate. Once the design was complete, it was transferred to the glassware using a combination of wax and transfer papers. Once the pattern was inscribed in the wax, the glass was taken to the to the dipping room where an acid etcher immersed the ware in a hydrofluoric acid bath. 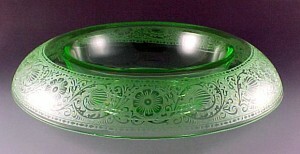 The exposed glass was eaten away by the acid, transferring the design etched in the wax to the glass. The length of time the glass was to remain in the bath was determined by the depth of the etching. I was fortunate to acquire the Morgantown "Mayfair" pieces at a local estate sale. It was near closing time on the last day of the sale, and I was able to purchase all you see (including the salad plates) for under $30. The tablecloth and napkins were also estate sale finds. Again, it was at the end of the sale when the best deals are made. I was able to purchase these as part of a tall stack of table linens, $10 for everything. If you've had similar experiences at estate sales, I'd love to hear about them! In the early 1960s, Morgantown received an order from its most illustrious customer. The Morgantown Glassware Guild advertised a leaded crystal glassware line called "The President’s House" in 1963. 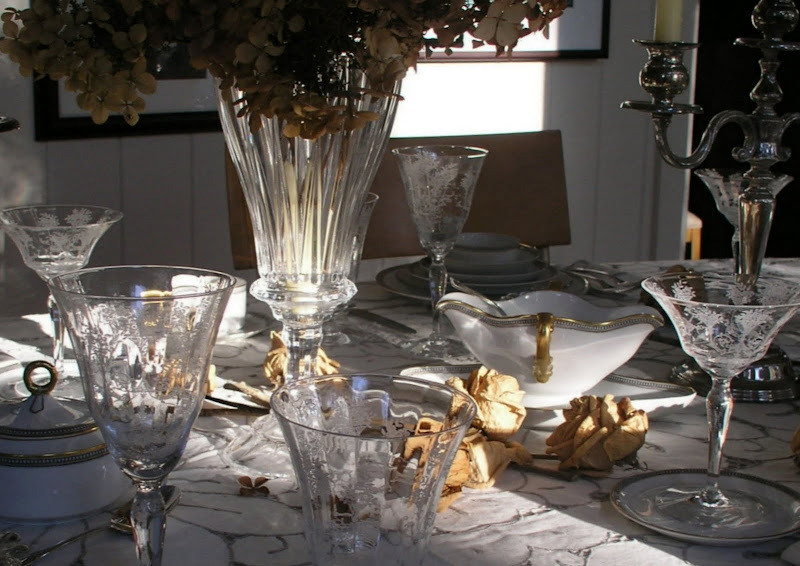 First Lady Jacqueline Kennedy had personally chosen this glassware line as the "Official Crystal Service" of the White House. It was a very simple, straightforward glassware design. President’s House glassware was identified with a paper label that read "The President’s House/Handmade Lead Crystal/by/Morgantown." 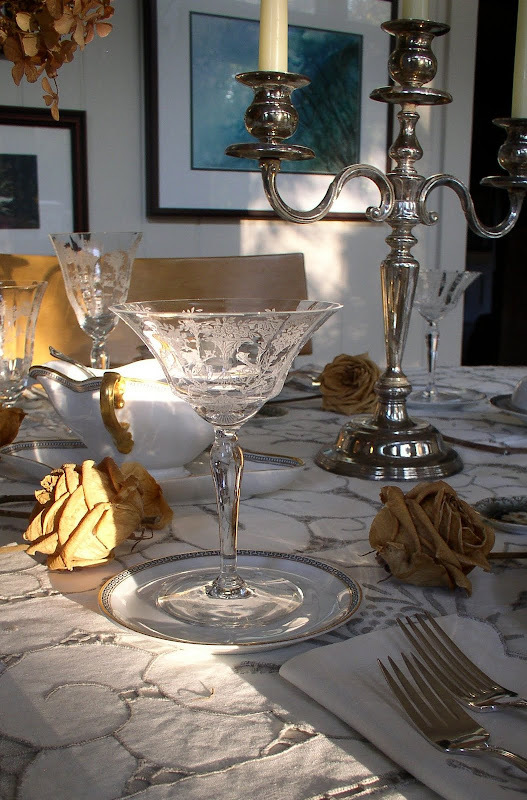 Shown in an early advertisement were three items from the line including an eight-inch plate, an Old Fashioned tumbler, and a Rhine Wine goblet. 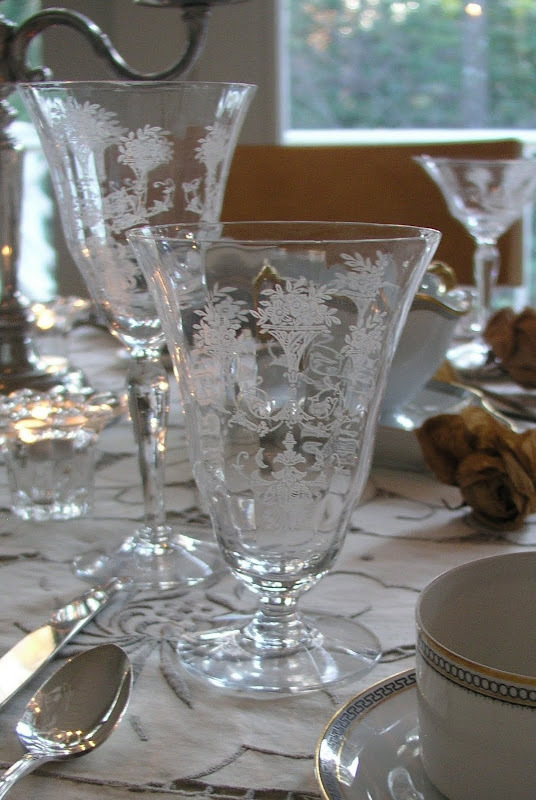 In 1967, The President’s House line would return to the news as the glassware pattern chosen by Lynda Bird Johnson for her December wedding. Hi, Another wonderful tablescape Bill. It looks beautiful in daylight as it does in candle light. The engraved glasses are magnificent. I have been looking for a set of butter pats without any success,yours are beautiful. I love the shape of the handles of the cups. Still having problems with your blog updates, but I will check every so often during the week, I was lucky that I did that just now and found you had this posting!!Jackie. Wow, what a stunning tablescape! It's put together so beautifully! Bill, this is so lovely! You always set the most beautiful tables. I haven't seen any of your posts, but I always try and check in periodically to see if something is wrong with google reader. I will be vigilant in doing that with your blog, Bill, because I love to read what you post. And this is no exception. Not only was your tablescape lovely, but the poem! It brought tears to my eyes. Just beautiful. I love the crystal. Isn't it great that Jackie picked that for the presidentital crystal? I think she had great taste and style. 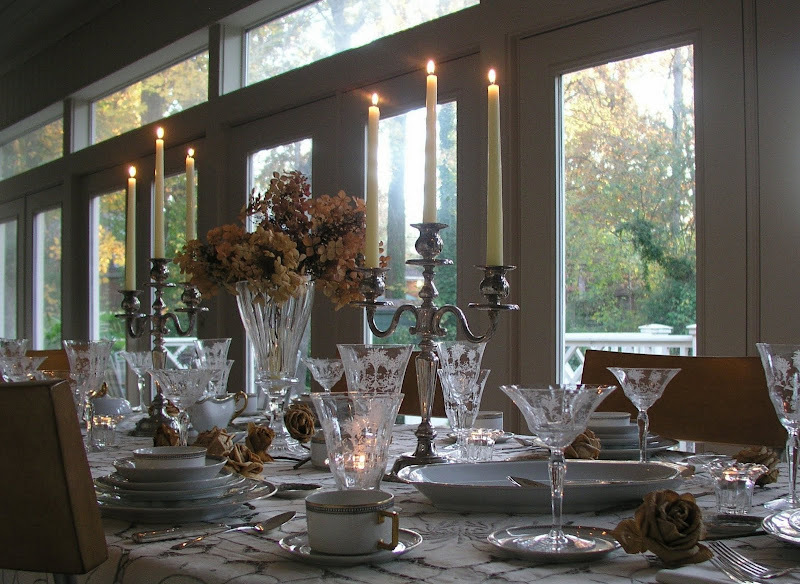 Another elegant tablescape. I love all the stemware. Thanks for all the information on the butter pats, I have several, but I had no ideal there were so many names for them. Thanks for visiting and your wonderful comments. 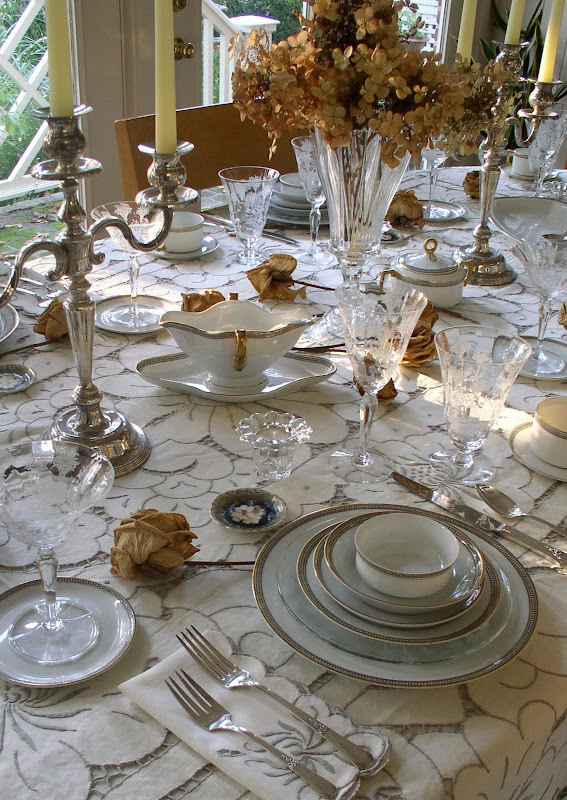 Beautiful table, everything is so elegant and loved the China, table linen, dried roses and hydrangeas. Glad to see you posting again, you are not showing up on my reading list. 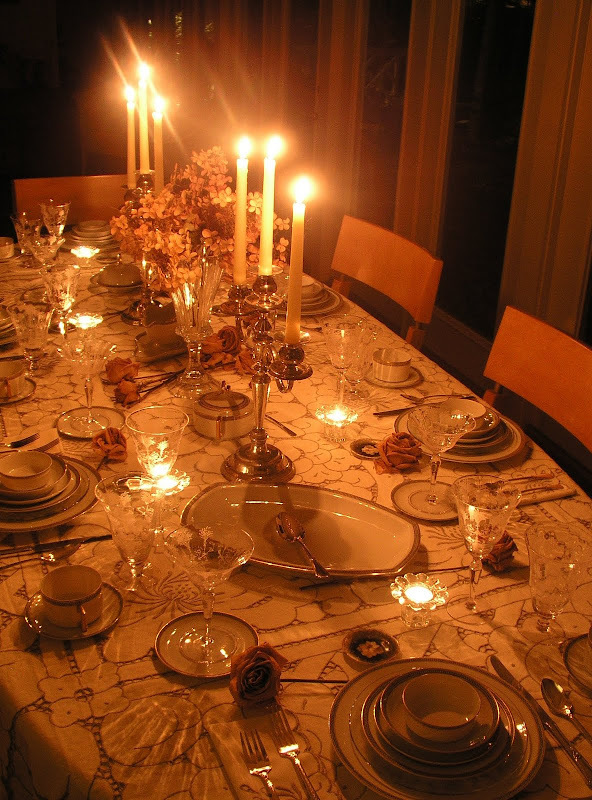 Bill -- your tablescapes are beautiful. Love the dried flowers -- they add just the right touch! BEAUTIFUL! Yes, I love Estate Sales, too -- I got a whole bunch of really good vintage white top sheets for next to nothing -- they were "tagged" tableclothes and no one had bought them . . . what a steal! Love your estate sale finds. This table is so elegant and beautiful. I was drawn to the dried roses contrasting with the tablecloth. Simply wonderful! 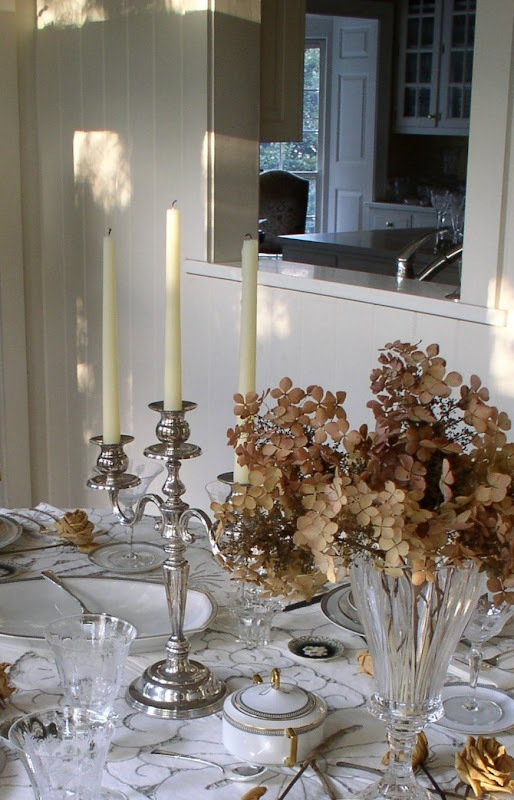 Beautiful table...I love the feel of the neutral tones! Wow, you are a guy who does his homework ! Stunning! 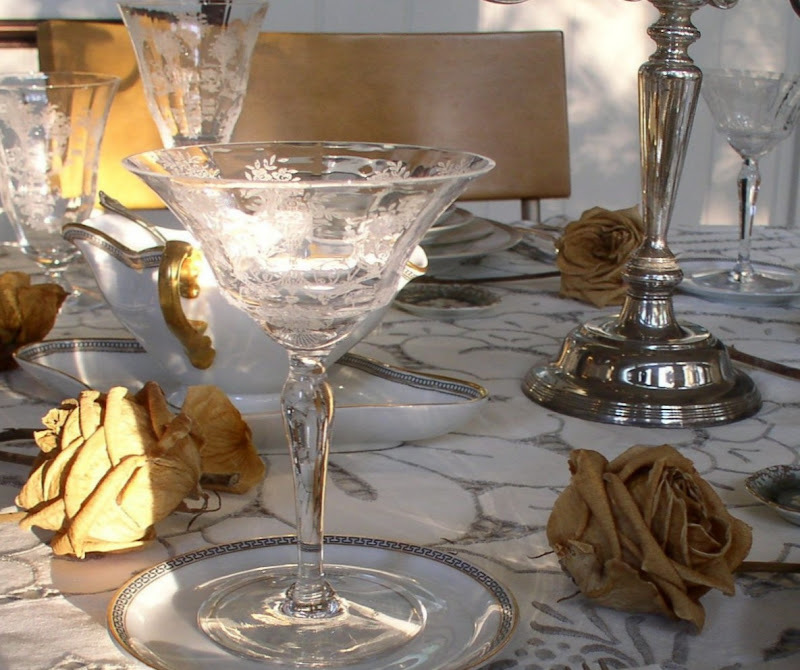 I love the linens and etched glasses. I have never seen such wonderful bargains! A beautiful table for sure! Bill, you never disappoint! This table is stunning as is the poem that you used for your text. The colors so perfect for this time of year. Thanks for sharing the interesting information about the china and crystal. I always learn so much from your posts. 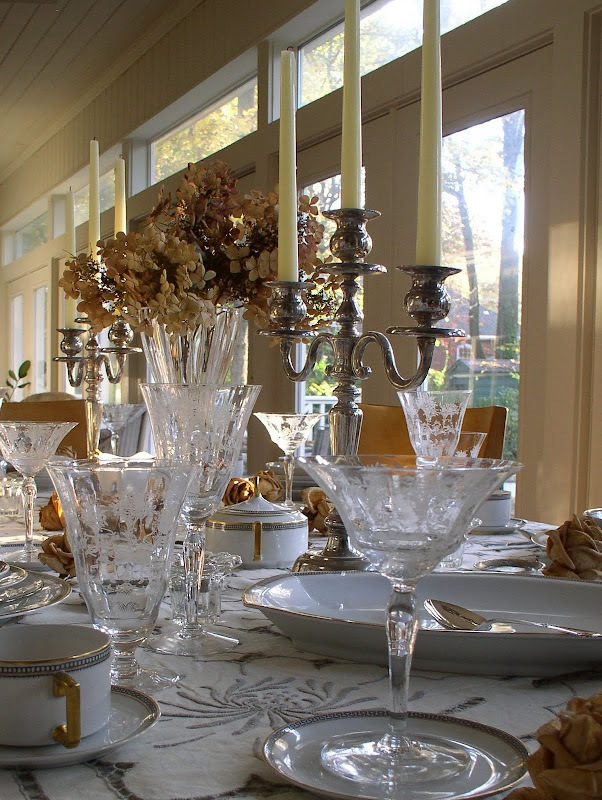 You must have an amazing collection of china, crystal, and flatware. Where do you store all of yours? Perhaps you should give us a field trip into your storage room. Oh Bill- Old elegance and and very posh. 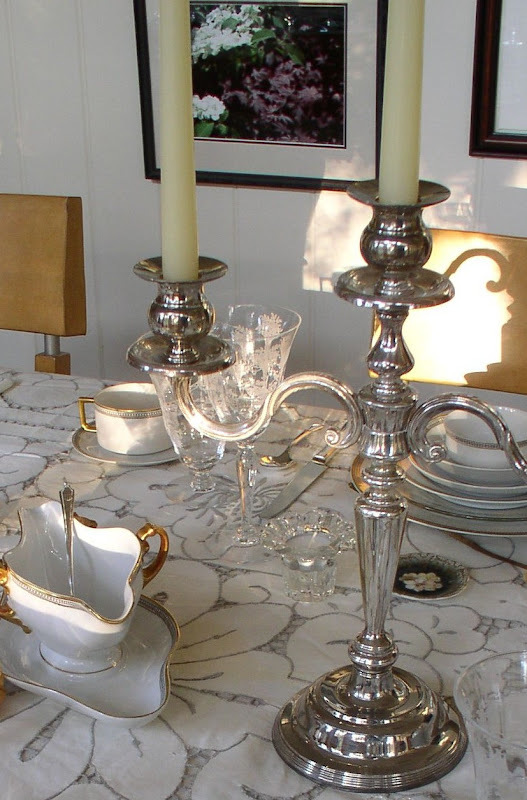 I just love the statement china, silver and etched crystal make! A bygone day where hospitality and good manners went hand in hand! You captured it so well. Thank you for the beauty you brought into my life this evening! So very elegant, and so romantic! I like the fallen dried roses on the table. The song by Charlotte Church is a very nice touch! When I saw the word subscribe, I thought "Is he publishing a book, or magazine??" Hmmmm, something you might should consider! Hi Dear Bill! Oh, what a gorgeous table! I love it. What beautiful pieces you have. The crystal is outstanding and I adore the pretty china. I'm upset because I can't add you to my blog list for some reason. A few weeks ago blogger decided to gobble up my blog list. I've just about got everyone back but I can't put you back in there along with a few others. I'm determined and will continue trying. Fabulous! Everything sparkles and looks so elegant! Bill, this is a gorgeous table! The sunshine hits all your crystal perfectly and it absolutely glistens. Then, when I saw it lit by candlelight, I was awestruck again. Beautiful! So pretty --- always, always --- so pretty! Dried flowers add alot of charm. I think I have some similar dishes stashed away for a rainy day, except mine are with a egg and dart pattern. Very, very nice Table you've created. Man, I didn't realize how sad that poem was!! I love the look of fall peeping through your windows!! It looks so cool with this particular tablesetting. I am wondering how you got such perfect dried roses; I like the effect it brings to the setting. I also like the way the tablecloth goes with the stemware!! Everything is so pleasing to the eye. Never heard of those butter pat (or whatever they were called) plates!! What a beautiful table display. I love the dishes and dried hydrangeas are the best. Thanks for stopping by and have a great evening. Bill, as sson as I saw your crystal I thought of my Grandmother. She had some etched wine glasses too, there are only 2 left and I ahve them and use them when I treat myself. They are such a wonderful reminder of her. Now, your table is gorgeous, love the roses and the colors are perfect for Nov.! Thanks for all the beautiful eye candy! I am going to go look again. Pinky PS, have never gotten an e-mail notice of your posts......hope you get it working! Ah, Thomas Moore....lovely! Stunning tablescape. :) Thanks for the visit today! This is definitely an incredibly beautiful table! The color scheme is magnificent. I so appreciate the glassware. I love a lot of the Fostoria etched patterns, but did not know about Morgantown. Beautiful!!! Just beautiful! I love the crystal - simply amazing. And the cut work on that tablecloth is gorgeous. You have so many wonderful things it must be difficult to choose what to use. But this is one of my favorites! Oh Bill! What a classic elegant table you set. That tablecloth is just wonderful. All of the elements come together beautifully. Thanks for sharing. MAGNIFICENT. This is so lovely, Bill. The crystal is so so awesome and lovely. I love the dishes, the flowers, the colors...everything. What a soft and yet strong side you have, dear friend. Thanks so much for the lovely poem, photos, work you did on this beautiful post. You are so so good at what you do. Thanks for everything. Lovely table. The table cloth withit's cutout design reminds me of linens I saw for sale on Cyprus. Thanks for sharing. 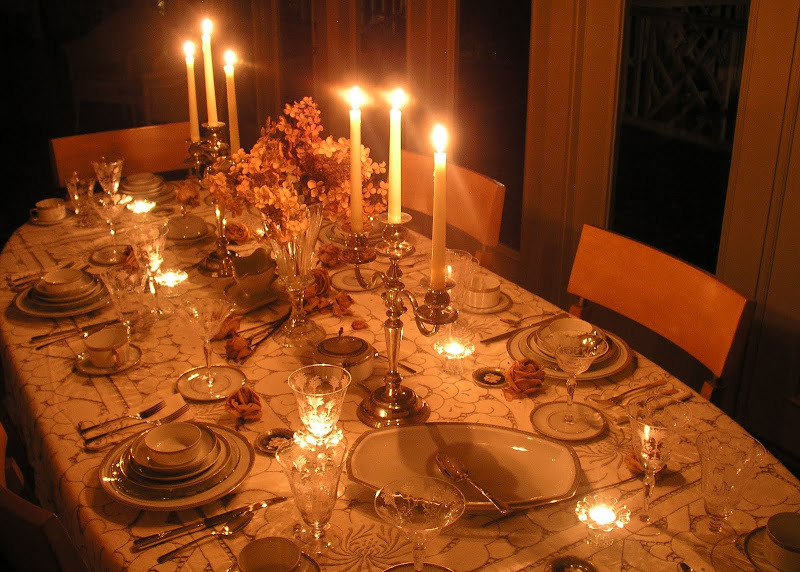 I always look for your tables first as I know they will be elegant feasts for the eyes. I am so glad to be receiving your posts again. There was definitely a problem, but I think it is now fixed. As always, I learn so much from you. Your tables are inspired. 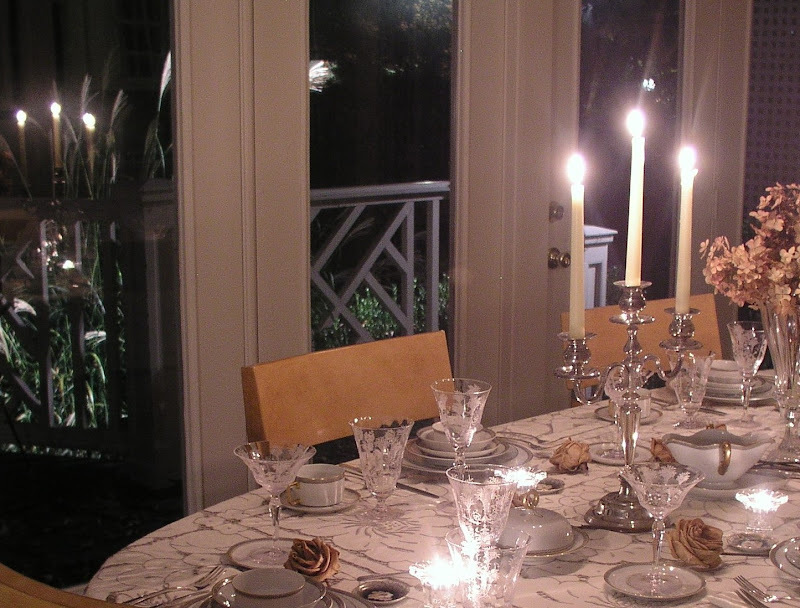 This tablescape, in particular, is so simple...and elegant. The dried roses and hydrangea are perfect! Thank you for sharing your expertise. And thank you for always leaving a warm and encouraging comment on my blog. Gorgeous tablescape!!! I love, love, love the glassware. You always find the most spectacular stuff at such fabulous prices. Dearest Bill....a visit to your blog is always such a magnificent treat for all the senses! As I slowly scrolled down the pages, my eyes danced over your exquisite collection, trying to take it all in, while my mind absorbed not only the words of the poem but the wonderful history you provided. Then I reach the end & my ears are treated to a beautiful rendition of the same poem! Sheer pleasure! I have never attended an estate sale but you have encouraged me to find one soon. I hope I'm half as lucky as you are at finding treasures. Thank you SO much for sharing them with us. Bill, I am speechless, your table is magnificent. I love the theme the Last Rose of Summer. A very interesting story about the Morgantown crystal. There are very few if any estate sales way out here in the country, I certainly do miss that. Just lovely...the stemware is beautiful and I love the dries roses - might steal that idea!! Your tablescapes take my breath away every week..Just beautiful. Beautiful table and poem. I love the etched crystal. 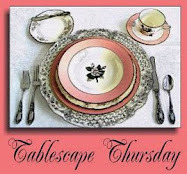 Although I stopped blogging quite a while ago, I enjoy looking through the tablescapes on Thursday. Your blog is new to me, and it is really a treat. I, too, love estate sales, and always go for the tabletop goodies. I really appreciate all the good information about your finds. Such a pretty table made beautiful by the sentiment attached. The glassware is so lovely and I am always surprised to see how many pieces have survived the time. You hit upon a great bargain there. I have gotten lucky at so many estate and yard sales in this area. I write about them often. Another beautiful tablescape! The stemware is so pretty. 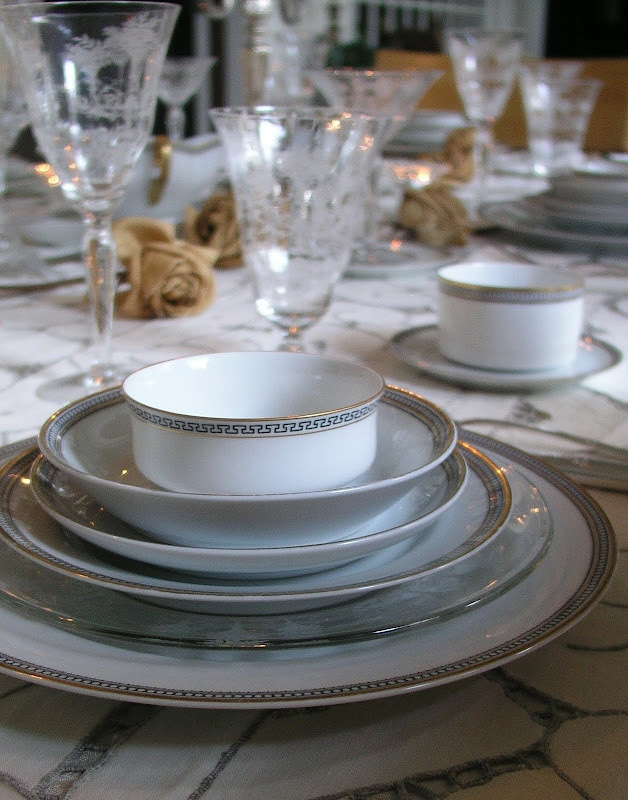 It is great that you are so knowledgeable about the pieces of tableware you buy. I don't know what is with the weather here in BC but I still have roses blooming. I know...crazy. I am in love with those beautiful glasses. They are little works of art. Wow, you have so many sets of exquisite formal china and crystal...I enjoy viewing your settings. Thank you so muh for joining me on my blog how wonderful. I can't wait to see more designs from your blog they are so charming. Bill, What a gorgeous table you do set. Everything is so lovely, and done to perfection. What a haunting song. Thank you for visiting my blog and leaving such a nice commnt. Hugs, Cindy S.
I love the glassware, so pretty. It must be fun to attend on of your dinner parties. How elegant! I posted a poem on one of my blogs this week too, not the last roses of summer but close to it with winter on fall's tail. You did a lovely tablescape. This was a very beautiful post and I love use of poetry to weave a narrative into your "step back in time." All of your pieces are exquisite but I really love that stunning tablecloth. I was so excited to see your blog today. This is the first time I have come across it. I opened it up and there were the same dishes my Great Grandma just gave me right before she passed away. They look exactly the same but they say something different on the bottom of them. Not sure if there was copies made from different company's?? 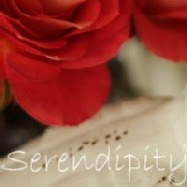 I loved how you presented them and I am looking forward to using your lovely ideas. Thank you! 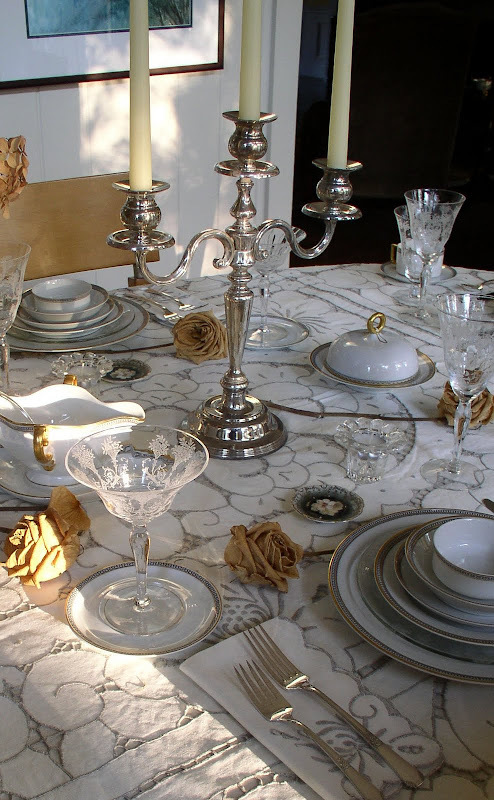 What a beautiful, understated, elegant table--I would never have realized that the pieces with touches of gold could be mixed with the silver pieces, but the brown of the flowers added just that additional gold-y/brown to make it all so beautifully co-ordinated and wonderful. I thought maybe you were taking a break from blogging, but I would guess I simply wasn't getting the notices. Tonight I did and I'm so glad to see your lovely table. I really think the dried roses add something so unique. It is really lovely. Hey Bill! Another beautiful post. I'm so excited this one showed up in my reader tonight. Maybe all the kinks got worked out? I have never heard of butter pat plates. Those are neat! Good morning Bill. Another beautiful tablescape from you. I love those glasses , they are so beautiful. The picture of your beautiful table and the windows behind it so you can look outside is my favorite, it makes the table look so festive. Everything is absolutely beautiful. The crystal is exquisite. You always do the best job with your tablescapes. I have missed your posts. I will check and see if there are any I did not see. Have a wonderful weekend. A beautiful table and a hauntingly beautiful poem. I have never heard that poem before. It is lovely. The crystal is just stunning and I enjoyed the background information. Bill~ ~ Love the look in candlelight. You have the most amazing pieces. Your tablecloth is lovely, as always. Make it a wonderful weekend! You have the best ideas. And you have a collection of the best treasures. This post was beautiful, it bought tears to my eyes. You did a wonderful job with the tablescape (as usual), the photography (as usual), the lighting (as usual), the information (as usual), and then the added perfection of the poem. Thanks for your comment to me. I feel like I've been away so long and it feels almost hard to start blogging again. I love visiting here though! 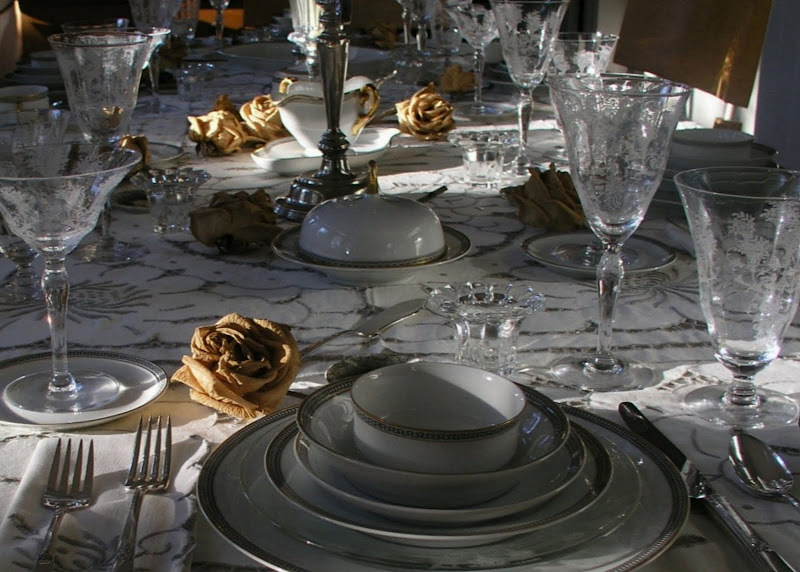 You can set my table anytime, because your tablescapes are truly magnificent! You’ve collected such beautiful items, thank you for sharing them. Bill, You have THE touch arranging all of your beautiful estate sale finds!! And your finds are just beautiful, once again. That crystal is to die for! I used to go back to sales on the last day, hoping that what I had seen the day before was still there. But I never had any luck. I don't take chances anymore- I buy right when I see it- even if I have to pay full price. Maybe someday I'll get lucky like you! 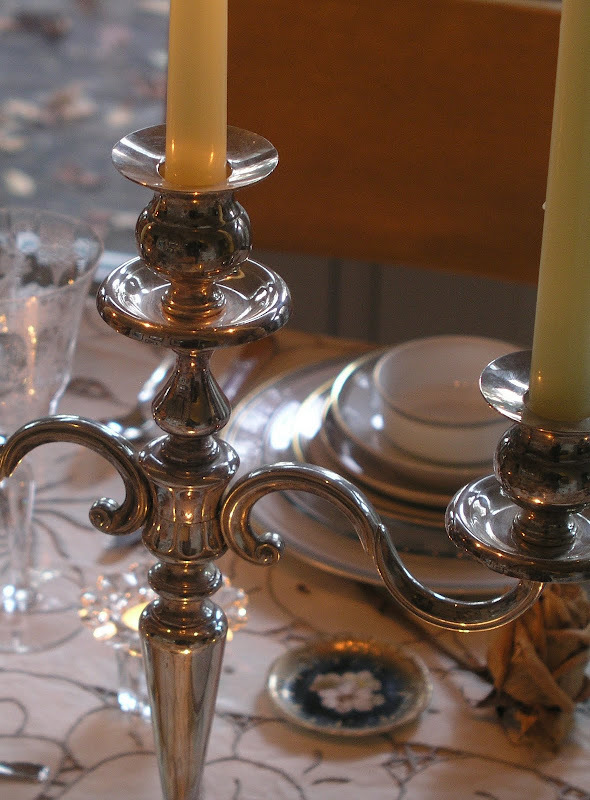 This has been a joyous first visit to the Tablescape blog and I can appreciate how time consuming it has been, putting your ideas together & graciously sharing. There are so many nice inspirations among all the displays here today. Whether one is a seasoned collector of all things "fine" or one needs to design on a shoe string budget (such as myself), you leave me feeling that "Beauty is Possible"
Thank you for encouraging a novice. Hello Bill, you always set a lovely table with an equally lovely story to go with it. I can't wait to see what you do over Christmas! Beatiful Bill! You're such an artist. I love those napkins, can't believe the deal you got on the linens! This post was remarkable, filled with poetry, sparkle, romance,dancing light and shadows, fine linen, ambiance extraordinare. It verse was velvety and smooth and soothing elegance. It reminded me of Ralph Laurens style...a delightful treat. PS. this did show up on my blog roll. Very well done, Bill. I love the etched crystal. I also love the tablecloth and I'm so jealous of how good you are with photography! 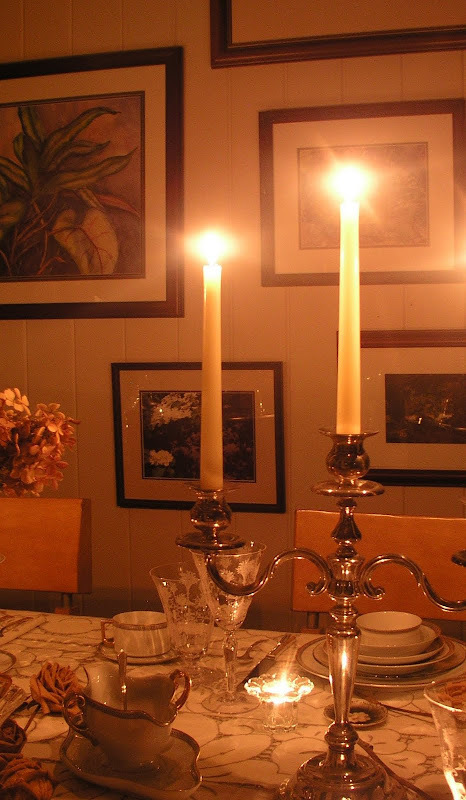 :) I can never get my candle lit tablescape to turn out like yours. I always look forward to see your t/s each week. If I had to pick my favorite crystal...this would be it.This tablescape is so beautiful with its dried roses and lighting. I love Charlotte Church.One of the most beautiful voices in the world. Thank you for all the info in this post.I know it must have taken you awhile to put this together. You did a outstanding job. Waw, i saw a post a time ago and was supposing you made some nice tables, but this is even better, i have no words for it. That is just amazing. 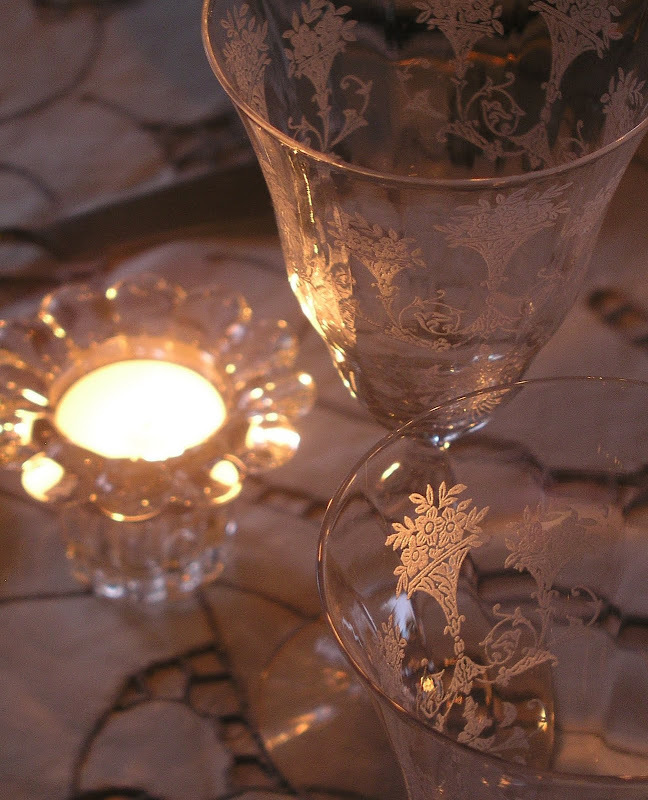 I love the etched glasses and the tablecloth is fabulous..
Gorgeous! The tableware all looks too good to actually use! Bill, this is one of the prettiest, most sentimental tables I have seen. In my opinion, your best! Beautiful post!